My brother, David, is gay. You can’t tell by how he walks or talks or dresses. You wouldn’t know who he loves and why unless you know him. The only clue, maybe, is that he happens to be nicer than the rest of my mother’s offspring, including me. Several years ago, I said to David: All you have to do to mess with people’s stereotypes is be out and be yourself. Whatever the ugly expectation might be: self absorbed, hedonistic, promiscuous, debauched, unable to relate to kids, whatever. . . David isn’t it. One time my mother was driving my tween-age nephews and their friends home from the Christian school they attended. Like boys often do, they were sneering about fags as a way to deal with their own budding sexuality. After dropping the other kids off, my mom said to my nephews, "You do know your Uncle David is gay, don’t you?" "But you were just saying you’d never hug a gay or take a gift from them or . . ."
"We didn’t mean, David! He’s our uncle!" The boys are older now, and grade-school prejudices haven’t survived their repeated contacts with Uncle David. From a telephone sampling of more than 2,000 households, university researchers found that Americans rate atheists below Muslims, recent immigrants, gays and lesbians and other minority groups in "sharing their vision of American society." Atheists are also the minority group most Americans are least willing to allow their children to marry . . . today’s atheists play the role that Catholics, Jews and communists have played in the past — they offer a symbolic moral boundary to membership in American society. 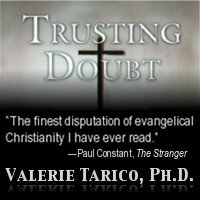 An Oklahoma court had to sift through jurors to find some who thought they might be able to trust the word of an atheist against a Christian. This is despite the fact that belief is the norm among American criminals but not among scientists who rise to the tops of their fields. Hemant Mehta, on his blog, Friendly Atheist, offers this tongue-in-cheek list: atheists are evil, angry, militant, baby-eating, unfunny, insensitive, immoral. Note: To go with angry and militant, they’re also young and male. 1. Find a kind, matter-of-fact way to let people know you lack a god concept. If you do fit the stereotypes, please — get some help. And try to take a little break from kicking puppies between now and that first therapy appointment. Seriously, a key quality of stereotypes is that the more dramatically wrong they are, the easier it is to violate them. When a panhandler says, "Thank you." I make a point to say, "You’re welcome. Since I don’t believe in gods I think it’s important for us to take care of each other." For most of the self-avowed atheists I know, all they need to do is put on a "Friendly Atheist" hat when they take their grandkids out for ice cream.